Jameson Irish Whiskey has reinforced its position as the world’s No 1 Irish whiskey with the announcement today that it has reached the significant landmark of four million case sales globally. This figure includes the sale of more than one million cases in the United States alone and underlines 23 years of consecutive growth for the brand. The announcement reflects recent sales figures which highlight the success of Jameson as an Irish export, where it is sold in over 120 markets. Sales volumes have increased by +15%, while value has increased by +18%*. Jameson’s largest market, the US, is growing at +29% with 49 of the 50 states in double digit growth. Key markets such as Russia and South Africa, where Jameson is now the second biggest international premium whiskey brand, also enjoyed huge success. 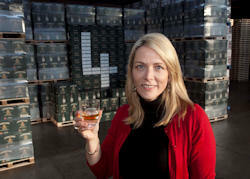 As one of Ireland’s most successful exports, Jameson is playing a key role in the export led recovery of the Irish economy. The whiskey has been distilled in Midleton, Co Cork, since 1975 where a recent €100 million investment was made by Irish Distillers to expand the distillery in order to cater for future growth, as it is now operating at full capacity. There is an additional €100 million investment in a new maturation site in Dungourney, Co Cork.